In 2006, the Yankees began building a new $2.3 billion stadium in public parkland adjacent to the stadium. The price included $1.2 billion in public subsidies. The design includes a replica of the frieze along the roof that was in Yankee Stadium. Monument Park, a Hall of Fame for prominent former Yankees, was relocated to the new stadium. Yankee Stadium closed following the 2008 baseball season and the new stadium opened in 2009, adopting the "Yankee Stadium" moniker. Yankee Stadium was demolished in 2010, two years after it closed. The 8-acre site was converted into a park called Heritage Field. The congested neighborhood was left without parkland for five years. The new stadium is located on 25 acres of what had been known as Macombs Dam Park. The Yankees had played at the Polo Grounds in northern Manhattan since 1913, sharing the venue with the New York Giants. 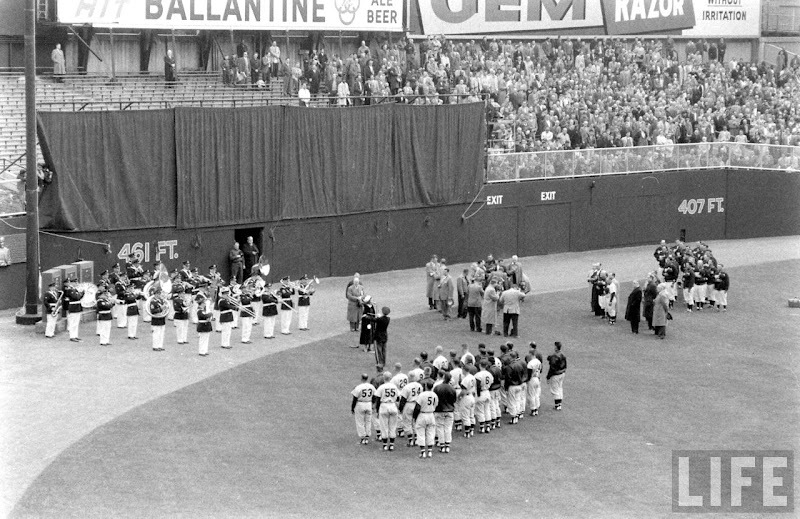 However, relations between the two teams were rocky, with the Giants harboring resentment towards the Yankees. For the 1920 season, the Yankees acquired star slugger Babe Ruth and in his first year with his new team, the Yankees drew 1.3 million fans to the Polo Grounds, outdrawing the Giants. By the middle of 1920, the Giants had issued an eviction notice to the Yankees, which was soon rescinded. In 1921, the Yankees won their first American League pennant (but lost the then-best-of-nine 1921 World Series to the Giants in eight games, all played at the Polo Grounds). This exacerbated Giants owner Charles Stoneham's resentment of the Yankees and reinforced his insistence that the Yankees find another place to play their home games. The Giants derisively suggested that the Yankees relocate "to Queens or some other out-of-the-way place". Tillinghast L'Hommedieu Huston and Jacob Ruppert, the Yankees' owners since January 1915, decided to build their own stadium. They did so at considerable financial risk and speculation. Baseball teams typically played in 30,000-seat facilities, but Huston and Ruppert invoked Ruth's name when asked how the Yankees could justify a ballpark with 60,000 seats. The doubt over the Yankees' lasting power was amplified by baseball's sagging popularity after the 1919 Black Sox Scandal, in which eight Chicago White Sox players were expelled for conspiring with gamblers to fix that year's World Series. Many people also felt three baseball teams could not prosper in New York City, but Huston and Ruppert were confident the Yankees could thrive amongst the more established New York Giants and Brooklyn Dodgers of the National League (which proved more than true, as both would eventually relocate to California following the 1957 season). The total bill for construction of the stadium was $2.5 million. Huston and Ruppert explored many areas for Yankee Stadium. Of the other sites being considered, the Hebrew Orphan Asylum, at Amsterdam Avenue between 136th and 138th streets in Manhattan, nearly became reality. Consideration was also given to building atop railroad tracks on the West Side of Manhattan (an idea revived in 1998) and to Long Island City, in Queens. The area Huston and Ruppert settled on was a 10 acres (4.0 ha) lumberyard in the Bronx within walking distance from and in sight of, Coogan's Bluff. The Polo Grounds was located on the Manhattan side of the Harlem River, at 155th Street and Eighth Avenue. Huston and Ruppert purchased the lumberyard from William Waldorf Astor for $600,000, equal to $8.48 million today. Construction began May 5, 1922 and Yankee Stadium opened to the public less than a year later. The stadium's walls were built of "an extremely hard and durable concrete that was developed by Thomas Edison", with total of 20,000 cubic yards (15,000 cubic meters) of concrete used in the original structure. In 1962, Rice University Alumnus John Cox '27 gave Yankee Stadium to Rice University. In the 1966–67 offseason, during the period in which Rice owned the stadium, the concrete exterior was painted white, and the interior was painted blue. The metal frieze circling the upper deck was painted white. Burke floated two proposals to build a new stadium on the same site in the Bronx; one included a dome. CBS also asked for 10,000 additional parking spaces and road improvements to alleviate traffic. In August 1971, the New York Giants football team announced that it would leave Yankee Stadium for a new football-only stadium in the Meadowlands Sports Complex under development in New Jersey. In 1971, the city of New York forced (via eminent domain) Rice to sell the stadium for a mere $2.5 million (equivalent to $14.6 million today). That December, after significant lobbying by Lindsay, the Board of Estimate approved $24 million ($140 million in 2014 dollars) for the city to renovate Yankee Stadium. The figure included $3.5 million for the purchase of the stadium and the 8-acre piece of land from Rice University and the Knights of Columbus. At the time, New York City was on the brink of bankruptcy. In January 1973, CBS sold the Yankees to a group led by George Steinbrenner for $10 million. Yankee Stadium closed for renovation on September 30, 1973. The Yankees would play all of their 1974 and 1975 home games at Shea Stadium. When the renovated stadium opened on April 15, 1976, the cost had ballooned to $160 million ($672 million in 2014 dollars). The cost was originally borne by New York City and is now being paid off by New York State. Yankee Stadium was the first three-tiered sports facility in the United States and one of the first baseball parks to be given the lasting title of stadium. Baseball teams typically played in a park or a field. The word stadium deliberately evoked ancient Greece, where a stade was a unit of measure—the length of a footrace; the buildings that housed these footraces were called stadia. Yankee Stadium was one of the first to be deliberately designed as a multi-purpose facility. The field was initially surrounded by a (misshapen) 0.25 miles (0.40 km) running track, which effectively also served as a warning track for outfielders, a feature now standard on all major league fields. The left and right field bleacher sections were laid out roughly at a right angle and to the third base stands, to be properly positioned for both track-and-field events and football. The large electronic scoreboard in right-center field, featuring both teams' lineups and scores of other baseball games, was the first of its kind. As Yankee Stadium owed its creation largely to Ruth, its design partially accommodated the game's left-handed-hitting slugger. Initially the fence was 295 feet (90 m) from home plate down the right-field line, referred to as the "short porch" and 350 feet (110 m) to near right field, compared with 490 feet (150 m) to the deepest part of center field, nicknamed Death Valley. The right-field bleachers were appropriately nicknamed "Ruthville". Although the right field fences were eventually pushed back after the 1974–1975 renovations, they were still relatively close to home plate and retained the "short porch" moniker. There is an urban legend that the stadium's field level was several feet below sea level, but that is easily disproven by observing how much higher the stadium site was (and is) than the level of the nearby Harlem River. In fact, the altitude of the old ballpark's site is 39 feet above sea level. The origins of Monument Park can be traced to the original three monuments of Lou Gehrig, Miller Huggins and Babe Ruth that once used to stand in-play in center field. Over the years, the Yankees continued to honor players and personnel with additional monuments and plaques. After the 1974–1975 renovations of Yankee Stadium, the monuments and plaques were moved behind the outfield fences to "Monument Park". A visual collection of retired numbers was soon added to this location. Monument Park remained there until the stadium's closing in 2008; after the new Yankee Stadium opened, the retired numbers, plaques, and monuments were moved into a new Monument Park in the new ballpark. One of the most distinguishing characteristics of Yankee Stadium was the facade, which consisted of a white frieze that ran along the bleacher billboards and scoreboard. It originally ran around the roof of the grandstand's upper deck. This original facade was made of copper and over the course of time, developed a patina (just like the Statue of Liberty). It was painted white in the mid-1960s. The iconic facade is employed in graphics for the YES Network and was incorporated into the logo for the 2008 All-Star Game held at the Stadium. In its existence, Yankee Stadium changed its dimensions several times. Many photographs taken throughout the stadium's history are used as references, as the Yankees were among the first to post distance markers on the outfield walls. The 415 sign, and its 367 counterpart in right field, were both covered by auxiliary scoreboards during the 1949 season. Those boards displayed the current game inning-by-inning along with runs-hits-errors. When the stadium reopened in 1976, the distance in straight-away center field was 417 feet (127 m). The deepest part of the outfield was in left center at 430 feet (130 m). The most recent field dimensions were reached primarily by moving the Yankee bullpen to left-center from right and making a few other changes so as to bring the left-center field wall in. The 1973-era left-center field wall locations could still be seen in 1976, as this is where the outfield bleacher seats began. 285 ft (87 m) 395 ft. 460 ft (140 m) 520 ft (160 m) 425 ft. 350 ft (110 m) 295 ft (90 m) 82 ft.
344 ft (105 m). 296 ft (90 m) 82 ft.
312 ft (95 m) 387 ft. 430 ft (130 m) 417 ft (127 m) 385 ft. 353 ft (108 m) 310 ft (94 m) 84 ft.
312 ft (95 m) 379 ft. 411 ft (125 m) 410 ft (120 m) 385 ft. 353 ft (108 m) 310 ft (94 m) 84 ft.
318 ft (97 m) 379 ft. 399 ft (122 m) 408 ft (124 m) 385 ft. 353 ft (108 m) 314 ft (96 m) 82 ft.
From 1951 through 2007, Bob Sheppard was the public address announcer at Yankee Stadium. His distinctive voice (Yankee legend Reggie Jackson has called him "the Voice of God") and the way he announced players for over half a century made him a part of the lore of the stadium and the team. Before a player's first at-bat of the game, Sheppard announced his position, his uniform number, his name and his number again. Example: "Now batting for the Yankees, the shortstop, number 2, Derek Jeter, Number 2." For each following at-bat, Sheppard announced just the position and name: "The shortstop, Derek Jeter." Due to health reasons, 97-year-old Sheppard announced his last game on September 5, 2007. He did sign a new two-year contract with the Yankees in March 2008 but lacked the strength necessary to do the job and missed the entire 2008 season, including the 2008 All-Star Game, which was played at Yankee Stadium. He could not announce the final game at the old stadium in September 2008, but recorded a video address that was played during the pregame ceremonies and also recorded the lineups for the game. He officially announced his retirement after the 2009 season. Sheppard died in July 2010. One of the most famous traditions for Yankee Stadium was playing Frank Sinatra's version of the "Theme from New York, New York" over the loudspeakers after every home game. In its 86 years of existence, Yankee Stadium hosted 6,581 regular season home games for the Yankees. Only Fenway Park (Boston), Wrigley Field (Chicago), Sportsman's Park (St. Louis) and Tiger Stadium (Detroit) have hosted more games. Due to the Yankees' frequent appearances in the World Series, Yankee Stadium played host to 161 postseason games, more than any other stadium in baseball history. The Stadium hosted 37 of the 83 possible World Series during its existence (not counting 1974–75, and the 1994 strike), with the Yankees winning 26 of them. In total, the venue hosted 100 World Series games. Many historic home runs have been hit at Yankee Stadium. Babe Ruth hit the ballpark's first home run on its Opening Day in 1923. Ruth also set the then-league record for most home runs in a single season by hitting his 60th home run in 1927. Roger Maris would later break this record in 1961 at Yankee Stadium on the final day of the season by hitting his 61st home run. In 1967, Mickey Mantle slugged his 500th career home run. Chris Chambliss won the 1976 American League Championship Series by hitting a "walk-off" home run in which thousands of fans ran onto the field as Chambliss circled the bases. A year later, in the 1977 World Series, Reggie Jackson hit three home runs on three consecutive pitches in the championship-clinching Game 6. In 1983, the Pine Tar Incident involving George Brett occurred; Brett's go-ahead home run in the ninth inning of the game was overturned for his bat having too much pine tar, resulting in him furiously charging out of the dugout. In Game 1 of the 1996 American League Championship Series, Derek Jeter hit a fly ball to right-field that was interfered with by fan Jeffrey Maier but ruled a home run. In Game 7 of the 2003 American League Championship Series, Aaron Boone hit an extra-inning "walk-off" home run to send the Yankees to the World Series. On August 6, 2007, Alex Rodriguez hit his 500th home run against the Kansas City Royals at the Stadium. In 2001, six weeks after the September 11 attacks, Yankee Stadium hosted an emotional three games in the World Series. For Game 3, President George W. Bush hurled the ceremonial first pitch, throwing a strike. In Game 4, Tino Martinez hit a game-tying home run off Arizona Diamondbacks closer Byung-Hyun Kim with two out in the ninth inning. Derek Jeter hit the winning "walk-off" home run in extra innings off Kim, earning himself the nickname "Mr. November". The following night in Game 5, the Yankees replicated their heroics from the previous night; Scott Brosius hit a game-tying home run off Kim with two outs in the bottom of the ninth inning en route to a win. On June 25, 1952, middleweight champion Sugar Ray Robinson sought his third title against light-heavyweight champ Joey Maxim at Yankee Stadium. More than 47,000 saw Robinson outfight Maxim but lose due to heat exhaustion in round 14 (due to the weather that topped 104-degrees Fahrenheit). The referee who declared Maxim the winner was the second that night; the first had left the fight due to heat exhaustion. In 1969, Notre Dame and Army reprised their long series at the Stadium (1925–1946 except 1930) with one final game. Celtic F.C. defeated New York Yankees in the first major soccer game to be played at the Stadium on June 28, 1931. In the coming three decades, a number of games between Jewish Palestinian teams and American all-stars were played. European club exhibitions first came in 1952, when on June 14, Liverpool drew 1–1 with Grasshopper Club Zürich. The next day, Tottenham Hotspur thrashed Manchester United 7–1, just a year after United had taken over for Spurs as champions of England. The following year, on June 8, the English national team defeated the U.S. national team 6–3, in a rematch of the Miracle on Grass match at the 1950 World Cup. On September 15, 1968, the U.S. national soccer team played an international friendly against the Israel national team at the Stadium. It was the first game for the U.S. in fifteen months and 10,118 saw Israel and the U.S. draw 3 to 3. National Hockey League (NHL) executives inquired about the possibility of using Yankee Stadium for an outdoor ice hockey match featuring the New York Rangers in the 2008–2009 season after the successful reception of both the 2003 Heritage Classic and the 2008 NHL Winter Classic outdoor games. If approved, it would have been the final sporting event at the current stadium. The NHL, however, decided to hold the second Winter Classic in Chicago, at Wrigley Field. ↑ 1.0 1.1 Consumer Price Index (estimate) 1800–. Federal Reserve Bank of Minneapolis. Retrieved November 10, 2015. ↑ Lowry, Phil. Green Cathedrals. ↑ Durso, Joseph. Yankee Stadium: Fifty Years of Drama. ↑ Robinson, Ray and Christopher Jennison. Yankee Stadium: 75 Years of Drama, Glamour and Glory. ↑ Yankees 2007 Schedule Retrieved July 20, 2010. This page was last modified on 3 January 2016, at 22:45.